If you could only wear one shoe for the rest of your life, a derby wouldn’t be the worst choice. A pair of derby shoes would be a better choice. Working equally well for work, the weekend or a wedding, derby shoes can be dressed up and down to fit nearly every occasion. What separates a derby from an oxford is the open laces, which can feel a little more casual than the closed laces of an oxford. If you do plan to own a pair of both, your best bet is a black oxford, which means you should opt for a brown derby, so that your two-shoe-wardrobe runs the gamut. 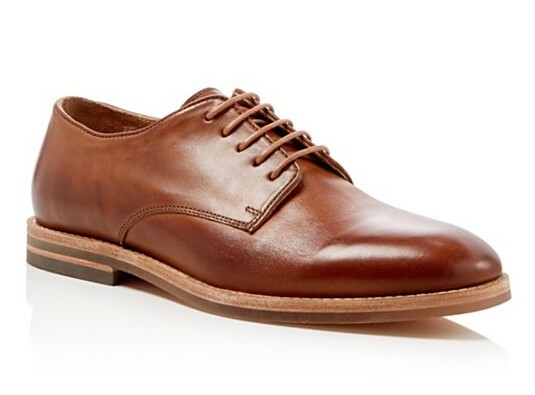 A brown derby is one of the most versatile shoes a man can have in his closet. Wear it well: Keep it classic for work by pairing your derbies with a navy suit. Wear it well: A fun jacket over your work clothes can make any outfit ready for a night out. Wear it well: Elevate your tee and jeans with a sleek shoe and soft yet structured jacket. Wear it well: Go business casual with colorful chinos and a tailored denim shirt. Wear it well: Roll up your jeans and skip the socks for a rakish look. WHERE DO YOU WEAR YOUR DERBY SHOES? Want to see more ways to wear your favorite pieces for summer? We show you how to style the chambray shirt, colorful chino and souvenir jacket, 5 ways.